Ed Christman was always writing — jotting ideas down in a pocket-sized notebook, doodling on meeting agendas, composing prayers on scraps of paper, and adding personal messages to the bottoms of postcards. EHe was always keeping notes on books and scripture to read, people to see, ideas to consider, places to be. Ed was continually working on the next sermon, prayer, blessing, dedication, or other message to be delivered. As a chaplain, he served as an all-purpose orator, as worship leader for university events, for small group activities, for weddings or for funerals. He preached often at Wake Forest’s weekly chapel services. 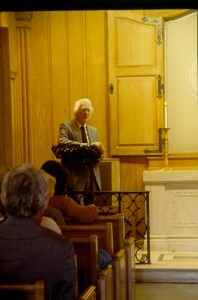 Ed preaching in Davis Chapel. On occasion Ed was invited to preach sermons at the Wake Forest Baptist Church. He preached dozens of ordination sermons for former students. He also traveled to preach or officiate at events. For example, he gave Baccalaureate sermons at Elon, Meredith, Wingate, and many other colleges and universities. He preached at churches in Winston-Salem and across the Southeast, traveling to Baltimore, Vicksburg and other cities. For more on the content and philosophy of his work, see A Chaplain’s Work and its related pages on Spiritual Leadership, Weddings, and Funerals. Sermons, eulogies, and other longer works by Ed Christman were generally crafted through several versions and over many hours.Through this time and meticulous attention, the piece would be memorized and then delivered, usually without notes, into its final form. The written record for these sermons, while only a portion of the total work, is collected and posted. The most complete set of final sermons come from the several dozen chapel sermons given between 1983-2003, which had previously been audio-taped and were later transcribed to become documents. Ed Christman, like any good pastor, was able to pray at the drop of a hat. As a chaplain, he delivered prayers for a wide array of events and situations. Some prayers were written quickly, scribbled on the backs of faculty meeting agendas; remember “God goes to faculty meetings?” These prayers were tiny yet always in sync with the agendas under which they appeared. Other prayers were crafted through several versions to be delivered at a memorial service or campus-wide event. In either case, he aimed to reflect the moment and then to inspire those present to think beyond it to something bigger. At Wake Forest, the chaplain was the university’s worship leader at Convocation, Founders Day, Baccalaureate, and Graduation. Ed wrote and delivered prayers of welcome and benediction at these events. Year-around, he prayed at dinners and celebrations, BSU gatherings and faculty meetings, weddings and funerals. Following are a diverse set of prayers dated between 1970-2003 and others which are undated. These include prayers from faculty meetings, university events, and other settings. Perhaps the least familiar of Ed Christman’s writing was his series of Jots and Tittles. This was a set of essays Ed wrote during the 1979-1980 school year. This set was perhaps, as a friend commented, a ‘blog’ before its time. The eight essays described his exploration of a series of events — return to school, a trip to the beach, a visit to distant family in Mexico, a conference in New York — and through the daily life of the school year. The link below takes you to the whole set. Ed preached at the wedding of Beth Pirkle to Bob Braxton 1967 September 3. Gordon Williams (freshman roommate of Bob’s) kindly recorded the service on reel-to-reel which later was put on an audio CD. I believe we have that (somewhere, Beth keeps up with such). In his own voice.